The 4-year-old Whitmore had the look of the best sprinter in the Midwest at Oaklawn Park this winter and spring. Now he can make a case as the best sprinter in America as he takes on the accomplished A.P. Indian in Saturday's $150,000 Maryland Sprint Stakes (G3) at historic Pimlico Race Course. Churchill Downs-based trainer Ron Moquett was torn between running Whitmore on Saturday's undercard of the 142nd Preakness Stakes (G1) or waiting for the Truth North (G2) June 9 in New York, which was the original plan. But the exercise rider – Moquett's wife, Laura – said the horse needed to run ASAP. Signaling his readiness, Whitmore worked in 46.40 seconds for a half-mile under former jockey Greta Kunzweiler Sunday at Churchill, the fastest of 59 workouts at the distance. That was his “easy” half-mile. Whitmore has shown that there is life after the Kentucky Derby, his last defeat coming five races back when he finished 19th of 20 in that race. Getting seven months off, the son of Breeders' Cup Classic (G1) winner Pleasantly Perfect started his current four-race streak with a second-level allowance race in New York. 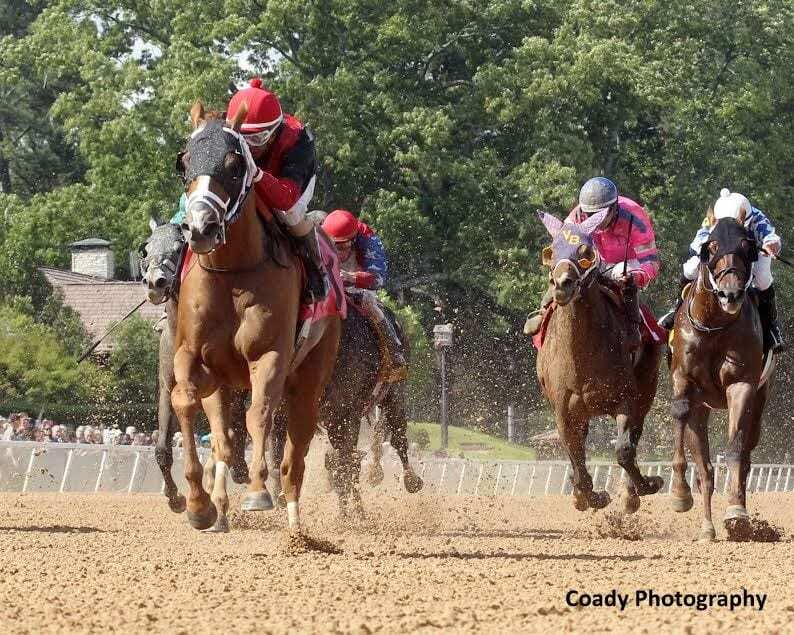 In Arkansas, Whitmore won a six-furlong allowance in 1:08.81 to miss the track record by a hundredth of a second, took the Hot Springs Stakes by six lengths and captured the Count Fleet (G3) by 3 ¾ lengths. He's now undefeated in six tries at six or 6 ½ furlongs. “We're trying to develop him into the horse that can make the most money,” Moquett said. “As a 3-year-old, you have no shot to make good money as a sprinter. They were beating me up on the radio [about running Whitmore long last year]. He only made $463,000 in six starts. It's not like he didn't run well. Ricardo Santana Jr. has the mount on Whitmore, who will van to Baltimore Tuesday along with the Moquett-trained Our Majesty for the $150,000 Adena Springs Miss Preakness (G3) and Torrent for the $250,000 Black-Eyed Susan (G2), both Friday. This entry was posted in Racing and tagged Horse Racing, maryland sprint stakes, pimlico, Pimlico Race Course, ron moquett, thoroughbred, whitmore by Press Release. Bookmark the permalink.